A 1.6-Liter I4 engine provides the vehicle with 130 Horsepower and 119 Pound feet of torque. 6-Speed Automatic transmission is what comes standard. Is it that time again to venture out and purchase a new vehicle? Have you narrowed your choices down to SUVs but haven't determined which would be the right fit for you? The 2018 Hyundai Santa Fe is a crossover SUV that has impressive features that make it a great option for those looking for value in their SUV purchase. Are you tired of the stress that can often come when shopping for a new car? It’s frustrating to unsuccessfully search for the right car at a price you can afford. Plus, add in the challenges of applying for loans, and the entire car-buying process is enough to try anyone’s patience. You should think about leasing your next car. With Hyundai Veloster lease deals in Exeter, CA, you can save money and get other benefits you don’t find with a purchase. Should I Buy a Used Hyundai Genesis Coupe in Dinuba, CA? 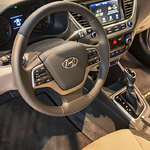 What’s So Great About Owning a Hyundai Elantra in Visalia, CA?